This is a list of diplomatic missions of the People's Republic of China. The People's Republic of China has a large diplomatic network, representing the country's significant economic, commercial, political, cultural, and military links around the world. For over fifty years the PRC has been competing with the Republic of China for diplomatic recognition in the international community. Until the 1970s, most countries in the world recognized the Republic of China instead of the People's Republic of China. As of 2018, a small number of states have full diplomatic relations with the ROC (see Republic of China diplomatic missions); the ROC maintains unofficial relations with most states. Much like the US, the PRC does not have honorary consulates in other countries. In 2015, China opened its largest diplomatic mission in Pakistan. 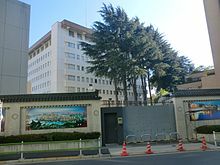 Chinese Embassy in Washington, D.C.
Wikimedia Commons has media related to Embassies of China. Wikimedia Commons has media related to Consulates of the People's Republic of China. This page was last edited on 25 February 2019, at 07:48 (UTC).